George Soulie de Morant went to China at the turn of the century, where he remained for almost two decades, gaining entrance to the highest circles of the Chinese society. Although his life’s work was acupuncture, his literary output was voluminous and covered every aspect of Chinese culture. He was a man of great talent, and became the only European recognized as a Chinese doctor by the Chinese themselves. Returning to France in 1917, Soulie de Morant spent the next 40 years actively promoting acupuncture among medical professionals. Just before his death in 1955, he completed l’Acuponcture Chinoise, the work which led the first successful European acculturation of acupuncture. l’Acuponcture Chinoise he laid the foundation for the modern practice of acupuncture in Europe, introducing many of the ideas and expressions by which it is known today. The text is massive, containing nearly 900 densely but readably organized oversize pages. Volume One describes the energetics of acupuncture; Volume Two, the application of those energetics; Volume Three, their relation to physiology. Volume Four summarizes the meridians and points, organizing information around the classical concepts of energy circulation, so that the reader perceives a clinical range much greater than that found in more recent English-language texts. 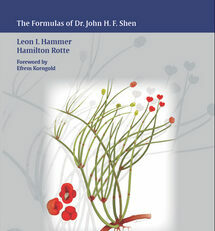 Volume Five, a detailed treatment repertoire, is still the largest of its kind in a Western language. The information has been meticulously compiled from works that are universally recognized as the epitome of Chinese clinical experience: the Zhen Jiu Da Cheng, the Zhen Jiu Yi Xue, theYi Xue Ru Men, and the Zhen Jiu Yi Zi. Illnesses are presented as energetic categories, and as organ, function, and body area groups. Within each of these categories conditions are precisely defined and finely differentiated. This level of practical detail has been achieved only in specialized sections of technical works, but never at this scale. 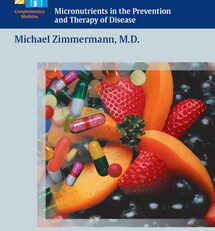 The book is universally recognized not only as a unique and historic achievement but also as one of the best, most detailed, and most practical of clinical texts. Soulie de Morant was the first and finest advocate of seeking and treating the root of illness in the disruption of an individual’s harmony with nature. He was the first to argue that there was no need to emphasize the incompatibilities between Chinese and Western medicines, and the first to propose hundreds of practical correlations with science. In many ways, he anticipated modern Western and Eastern needs by showing biomedicine how to expand its clinical gaze to include the qualities and relationships discovered by Chinese physicians. 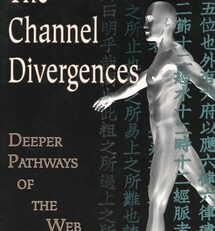 Chinese Acupuncture conveys the ideals of the Chinese medical arts to Western doctors and acupuncturists. It captured the imagination of an entire generation of physicians and continues to inspire those who write or practice today. 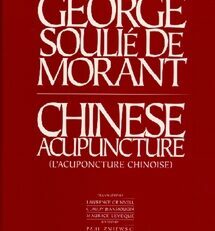 Publisher’s Comment on Chinese Acupuncture by George Soulie de Morant. This book has an interesting history which is described in the introduction by Paul Zmiewski. It also has an interesting publishing history. We first learned of Soluie De Morant’s work in the late 1960’s from macrobiotic teachers who, based upon his book with Yukikazu Sakurazawa (George Oshawa), believed that De Morant had learned acupuncture from Oshawa in France. Among those interested in acupuncture in the early 1970s, this discouraged further research because people were looking for technical instruction and assumed that Soulie de Morant’s Chinese Acupuncture would thus be like Oshawa’s writings. Although this rumor was clearly untrue, it contributed to an important trend in the early transmission of acupuncture by directing attention to other French writers, for example, Chamfrault. Ironically, because George Soulie De Morant learned acupuncture through twenty years of research and practice in China, his work was actually more easily applied in practice. However, by 1975, when copies of L’Acuponcture Chinoise became available through Quebec, it became a primary source, not only for the theory of acupuncture energetics but also for acupoint locations and indications. In particular, his fifth book, “Treatments,” was invaluable because it was arranged much like a homeopathic repetory and could be easilly accessed. However, its influence did not spread beyond Europe and the Eastern U.S. In 1981 Paul Zmeiwski found a GSDM translation at the Sri Aurobindo Ashram in Pondicherry India. We immediately decided to pursue it. The translators, Lawrance (Dhruva) Grinnell, Claudy Jeanmougin, and Maurice Leveque were a French-American team who had translated the text from respect for it. It was their primary source for clinical practice at the Ashram. It was rumored that a British academic publisher had attempted the publication and failed, but we were not then dissuaded because we believed that their problem must have been the lack of Chinese references. Without a Chinese language glossary the scope of Soulie De Morant’s work was so great that it would be impossible to insure the transmission did not become garbled. However, we were already working with Wiseman’s original lists, and GSDM was rigorous about keeping links to the Chinese, so we were sure we could overcome this problem. By 1984 when we were finally able to negotiate a contract with the French publisher, almost a decade had passed, but Soulie De Morant’s work was still almost unkown in the U.S. However, T.C.M. had begun to dominate the American market. This changed the character of the project because it was now unlikely, if not impossible, for L’Acuponcture Chinoise to find the endorsements it would need to successfully compete with T.C.M. For example, during most of the early 1980’s there were strong opinions expressed about “five elements” as an oppostion to T.C.M. Arguments about symtomatic versus root acupuncture were hotly contested and the acupuncture Soulie De Morant reported fit neither of these ideas. Furthermore, we had realized that were it true that a large university press had abandoned the project, it was probably a purely economic decision. The translation had been typed into a first generation disk-based typesetting machine. That left no inexpensive option. We could typeset it as is, without translators’ changes or conventional editing. This, of course, is what the machine’s owners had in mind. When we refused, we were told we could have no further copies of the manuscript. Unless the machine’s owners were guaranteed the typeset, and prepaid, we would need to start from scratch. The book almost languished in a drawer beneath the mailing desk. Fortunately, “George,” as the book was know to those of us working on it, is so fascinating that everyone kept working despite the lack of any particular commercial plan. Mary Kinneavy, then an acupuncturist, now a teacher at the New England School of Acupuncture, retyped the entire MSS while answering phones at Redwing Books. Trained in Japanese acupuncture, Mary found it fascinating. Diane Putt, did most of the consistency checking, text and index programming, when her then state-of-the-art 80286 UNIX machine was free of invoicing and statementing. Paul and I re-translated and did editorial chores. Martha Fielding and Dhruva Grinnel edited and proofed, Paul spent three weeks in Paris where George’s heirs kindly gave him access to the orignial note cards GSDM used to prepare the book. Gail Neubert revised the punctuation, and Sally Rimkeit and Missa Olatunji, acupuncturists and teachers in New Zealand, also edited most of the first three volumes. Other readers worked on the project but their input arrived too late to use because we had crossed our contractual publication deadline. 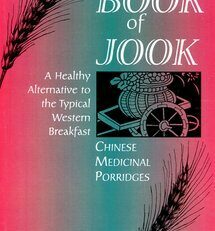 Clearly, Chinese Acupuncture has never acheived the recognition it might have accomplished had it been in print in the early 80s’. 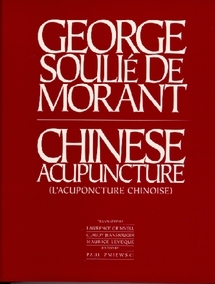 Regardless, George Soulie De Morant’s work is one of the seminal events of acupuncture’s westward transmission and remains a significant reference for experienced clinicians.